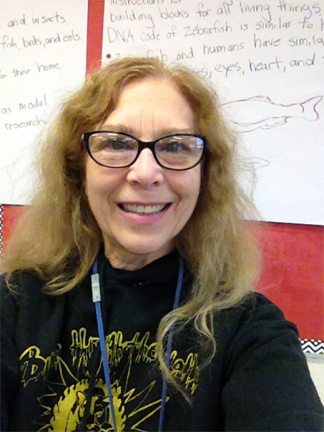 Ellen Kenney has been with BioEYES since the 2007 school year. She has been a great Model Teacher to the program for the past eight-plus years. We look forward to working with her each year. What are one or two previous positions you held? I taught middle years' science at George Washington Elementary School for sixteen years. I enjoyed exposing my daughter and son to nature, animals, and science and saw an opportunity to share this love of learning with other children and young people. How did you find out about BioEYES? I responded to an e-mail. The program sounded interesting and I was looking for more hands-on, minds-on activities for my students. What is your favorite part about bringing BioEYES to your classroom? The best part is when the students realize that they can see the heart beating in the tiny embryos as they look through the microscopes. It's a real "aha" moment for them. When not teaching, what are some of your hobbies? I like to hike, camp, ride my bike, and go the folk festivals. I love the beach and visiting my daughter, son-in-law, and two beautiful granddaughters, who live in Budapest, Hungary. Do you have any class pets? No, but I have nine cats and two turtles at home. What is one thing most members of the education community don't know about you? I'm not sure. I'm pretty much an open book.